Robert F. Kennedy And the Death of American Idealism (Library of American Biography Series) 1 Edition At the forefront of the social movements and political crises that gripped America in the 1950s and 1960s, Robert F. Kennedy saw, advised and led the United States through some of the most epochal events in the 20th century. 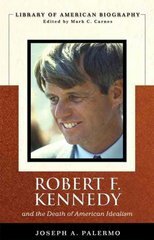 This newest edition in the Library of American Biography Series chronicles the life of Robert F. Kennedy from his time as a boy growing up amidst the turmoil of the Great Depression and World War II to his rise as a central figure in the national debate on communism, poverty, civil rights, and the war in Vietnam. The titles in the Library of American Biography Series make ideal supplements for American History Survey courses or other courses in American history where figures in history are explored. Paperback, brief, and inexpensive, each interpretative biography in this series focuses on a figure whose actions and ideas significantly influenced the course of American history and national life. At the same time, each biography relates the life of its subject to the broader themes and developments of the times.